For its inaugural show, JGM Gallery is proud to present the first UK exhibition by Australian Aboriginal artist, Kittey Malarvie (b.1939). Founded by Jennifer Guerrini-Maraldi, the new space will deliver a rich programme of exhibitions and events devoted to contemporary Australian Aboriginal art. Kittey Malarvie: Milkwater and Luga is the first in a series of exhibitions that aims to demonstrate the rich potency, symbolism and heritage of Aboriginal art and culture on an international arena. Malarvie’s subtle, abstract paintings reflect the artist’s deep-rooted connection to nature and her work consists of layers of cultural meaning, childhood memories and recollections of family histories. The two series presented at JGM Gallery, Milkwater and Luga, depict the remarkable desert landscape around Sturt Creek, Australia, where the artist spent her childhood, an area that sits between the Great Sandy Desert and Kununurra, Western Australia. At the heart of Malarvie’s practice is an enduring connection to her traditional country and childhood memories as a way of reconnecting with a time before the disruptions to family and cultural traditions that have occurred during her lifetime and throughout Aboriginal history. Painting in a palette of soft earth ochres, including natural pale pinks, black, greys and milky white, Malarvie translates the language of place into energetic gestures of abstraction. Layers of circle motifs in the Luga paintings represent a land that is flooded and dry by turns, leaving behind the patterned ground of luga – the cracked mud across the parched black soil plains of Sturt Creek. The white circles specifically refer to the salt crystals found in the mud and that are believed to have healing powers. Malarvie’s recent Milkwater series, by contrast, is a meditation on the multifaceted play of wind and light on this same area of land in times of flooding, when the water takes on the eerily beautiful colour of milk. 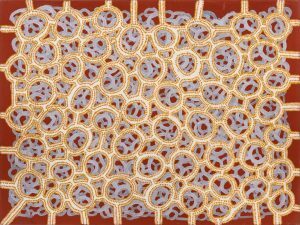 Like many Aboriginal artists, Malarvie works within the iconographic traditions of the desert, deeply in tune with the natural environment and ecology. Herself a healer, Malarvie’s paintings seem to capture not just the elements but also a certain energetic presence within them. Having had her first solo exhibition at the age of 68, these series together also form a visual biography. In her own words, ‘When I paint, I remember my childhood… when we were all together…’, an homage to her late sister. 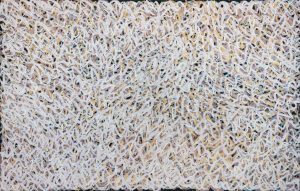 For the Aboriginal community today, painting – inasmuch as it is a form of traditional mark making with a centuries old existence – retains its communicative function. Dating back 60,000 years, Indigenous Australian culture has consistently used painting for demarcating space, place and body: from paintings of detailed maps in the red sandy soil to ceremonial body painting and decorating traditional objects. In more recent decades, Aboriginal art can be viewed as a re-assertion of identity set within the context of a long and difficult period of colonial dominance and displacement. According to Jennifer Guerrini-Maraldi, Director of JGM Gallery, ‘Aboriginal artists are custodians of a different aspect of the earth – they have intellectual copyright for a pattern which has symbolic meaning… and a spirituality that is uplifting’. A fully illustrated catalogue of the exhibition has been published with a newly commissioned text by award-winning poet and journalist Olivia Cole. Based in Battersea, JGM Gallery is London’s only dedicated space for contemporary Indigenous Australian art. JGM Gallery aims to establish a greater awareness of Aboriginal art in the UK and internationally. The Gallery works only with registered Aboriginal owned art centres across the whole of Australia, ensuring that works are ethically sourced and that local communities directly benefit. 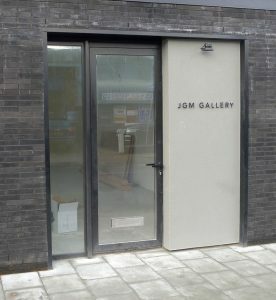 Located in the heart of Battersea, JGM Gallery is set to become one of the cultural markers of the neighbourhood, which is already home to the Royal College of Art, Battersea Arts Centre and Battersea Power Station. Kittey Malarvie was born at the Brockman gold mine near Halls Creek, Western Australia. Malarvie travelled with her family to the East Kimberley township of Kununurra in the early 1970s where she first learned boab carving and artefact making with her parents. She turned to painting in 2006, having first assisted the late Rover Thomas (c. 1926-1998) and Billy Thomas (b. c. 1920). She works through one of the earliest Aboriginal art centres in the region. Her works are included in international collections at the Nevada Museum of Art, the National Gallery of Australia Collection and the Government of Western Australia. We (my husband, Count Filippo Guerrini Maraldi and I) have been building our own art collection including Australian Aboriginal art, for more than 20 years . 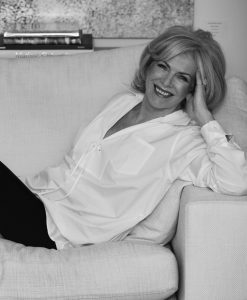 Following my career as a journalist in London, I transformed my passion for fine art into my business. JGM ART has been exhibiting and selling the best art from Aboriginal Communities across remote Australia for a decade. I have been dealing privately from No 1 Battersea Square, (our uber contemporary home – a modern apartment with views across London and the Thames) as well as showing Aboriginal art in Milan Italy, USA and the most prestigious art fairs in London, including Masterpiece Fair, an annual highlight of the London calendar each June. We are so excited about the launch of our new Gallery which is beautifully situated next door to the Royal College of Art, Sackler school of Painting. The RCA are siting their entire London Campus in Battersea, and opposite our new gallery will be their newest development, designed by award winning architects Herzog de Meuron. It is going to be a serendipity to be situated bang in the middle of the RCA and some of the most revered young creatives today. JGM Art has entered a painting for donation to the Charity Art Auction by Kaye Bush from Mornington Island. Kaye painted with the late Sally Gabori. The work is 91 x 61 cm.